And so we enter the world of Beartown on a Friday in March when everyone is waiting for the Beartown Ice Hockey junior team to play in the semi-final game in the biggest youth tournament in the country. Many think that winning this game will revive the dying town’s fortunes. Others simply want to win because it’s Beartown. Peter is the general manager of the hockey club that includes the junior team. He’s a hometown hero who returned after playing in the NHL. He loves hockey, but his family means everything especially since their son’s death back in Canada. He and his wife, Kira, appreciate that Beartown protects their children as they do. Their daughter, fifteen-year-old Maya is a great kid, but when she goes to a party after a big game, things get out of hand. Kevin is seventeen and he’s the star of the team, a player who can take them far. His best friend Benji’s father committed suicide and hockey is his life. He protects Kevin on and off the ice but some wonder if he might go too far. Amat is fifteen and the coach has moved him up to the junior team because they need his speed. He lives on the wrong side of town with his mother and most people don’t want someone like him on their team. Because of the tragedy and the plight of the town, the novel veers toward darkness in places, but Backman’s glorious characters shine through. Each one offers a case study in friendship, loyalty, love, sacrifice, and hope. This novel will break your heart then put it back together and make it stronger. The narrator's aphorisms could have been pretentious, but instead, they made this reader feel as if one of the town's wise residents was talking directly to me. The best novels about sports are never actually about sports. Friday Night Lights was so much more than a football novel and Beartown showcases the world as seen through hockey's lens. It's a masterful, coming-of-age thrill-ride of a novel. 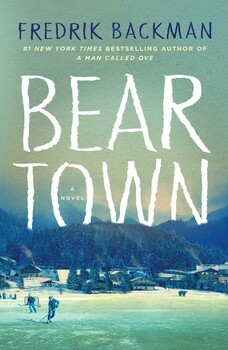 Summing It Up: Beartown is a wondrous tale of family, friendship, love, and hope packed with unique characters. If you love hockey you’ll adore Beartown. If you don’t care a whit about hockey, you’ll still love Beartown. Fredrik Backman is one fine storyteller and Beartown is a winner. I loved A Man Called Ove, but Beartown is a stronger book. It’s more nuanced, yet it has the heart and humor that was the best of Ove. Note to Chicagoans: with the Blackhawks’ early exit from the playoffs, Beartown is just what you need to get through the Stanley Cup.